KUCHING: Non-governmet orgnaisation, Dayak National Congress (DNC), has defended Works Minister Baru Bian on his take on the issues surrounding the perimeter survey of landing having native customary rights (NCR). He noted that the original statement that accused Baru of not sourcing for funds from the federal government on surveying NCR lands was issued by a political secretary to the Chief Minister, Susan Chemerai. “What this political secretary said totally reeks of arrogance and ignorance. It also lacks moral and legal basis,” Paul commented. He said land is a state matter under the State List of Schedule Nine of the Federal Constitution which makes it the legal and constitutional responsibility of the State Government to survey and issue titles to the Natives over their NCL. “We would like to remind the State Government not to play too much politics with regards to the peoples welfare. If the State Government is fully committed to its autonomy pledge for Sarawak, this is the matter that it has to show the people that it can deliver to the people what it pledged to do. Paul claimed that the State Government has already failed in its promise to recognise NCR Pemakai Menoa and Pulau Galau (PMPG) as demanded by the Dayak community in consequence of the TR Sandah court case. “Instead they give something else which is not even NCR land. Its just like people are asking for fish, you give them snake and people ask for bread, you give them stone. “It is totally flabbergasting for people like Susan to promote perimeter survey under Section 6 when the end result is turning NCR lands into state lands! The Court of Appeal in the case of ‘Sagau Batu Bala V Zahara Mustapha’ has already ruled that lands reserved under Section 6 are state lands; not NCR land. “I would like to remind her that she is a government servant and her salary is paid by the people of Sarawak; not by political parties,” said Paul. “Since she said that Section 6 is a big step to the issue of title under Section 18, it shows that she is ignorant about the mechanism of the Land Code. Titles are issued under section 18 pursuant to Settlement Operation under Part V of the Land Code. He added that the State Government can only give state land; not NCR lands (which are already owned by the Natives). “Perhaps Susan needs to go back to law school and learn more about the Land Code, Cap. 81. There have been so many broken promises of economic empowerment by the pervious BN government [now GPS] on NCR land. “What the natives got in return is hundreds of cases in the courts with the NCR land developers. We have not heard of natives becoming wealthy through those schemes. Those who get rich are instead the developers but not the native landowners. “Dont ever forget that many of our Natives have been arrested, assaulted and died in their fight for their NCR lands. Where were the people like Susan who now wants to be a heroine? “It looks like the GPS government is just BN 2.0 rather than a new entity as it claims to be. It is more interested in just playing politics than serving the people. How can the BN/GPS government that has ruled Sarawak for 55 donkey years look at itself in the mirror and compare its failure to the PH Government that only came to power six months ago? 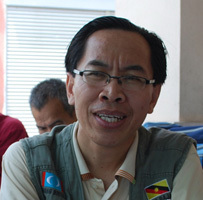 “Our final reminder to the GPS Government is, the people are watching and are anxious for change of power in Petrajaya. Challenging Baru to prove his mettle in the fight for NCR is childish to say the least and it is just like a school boy telling a Professor to prove expertise in his field of study! “I would like to advise Susan who seems new in politics go to and help the people fight for their NCR lands instead of telling YB Baru of what to do,” he sounded off. “We have not forgotten our PMPG that has been written off by the GPS government pursuant to the Land Code Amendment Ordinance 2018. The people are now smart enough. We only choose a government that works for the people, not a government that serves only the interest of the elite group,” he stressed. Apart from DNC, Parti Bansa Dayak Sarawak Baru (PBDSB) has also came forward to defend Baru over the issue. The Sarawak government has taken pain to explain that the amended provision of the Sarawak Land Code in fact provided for the legal recognition of the PMPG provided the Land Registrar approved the applications for land with PMPG to become native territorial domain (NTD).